Why is this so important to do this now? After all, the holidays are upon us and you just bombarded your employees with emails, postcards, benefit guides and other enrollment information. Isn’t that enough? We say, strike while the iron is hot. Companies invest significantly in their benefits programs, making up approximately 30% - 40% of an average employee’s compensation. Yet, most employers will tell you that their employees just don’t understand the value of their benefits or know all that they have. That’s why it is so important to take the time, post-enrollment, to review and reflect… what worked well and what didn’t? What drove enrollment decisions and what were the sticky points? What messages need to be reinforced? Now is the time to collect feedback from employees and use this information to fine-tune your ongoing communication strategy. 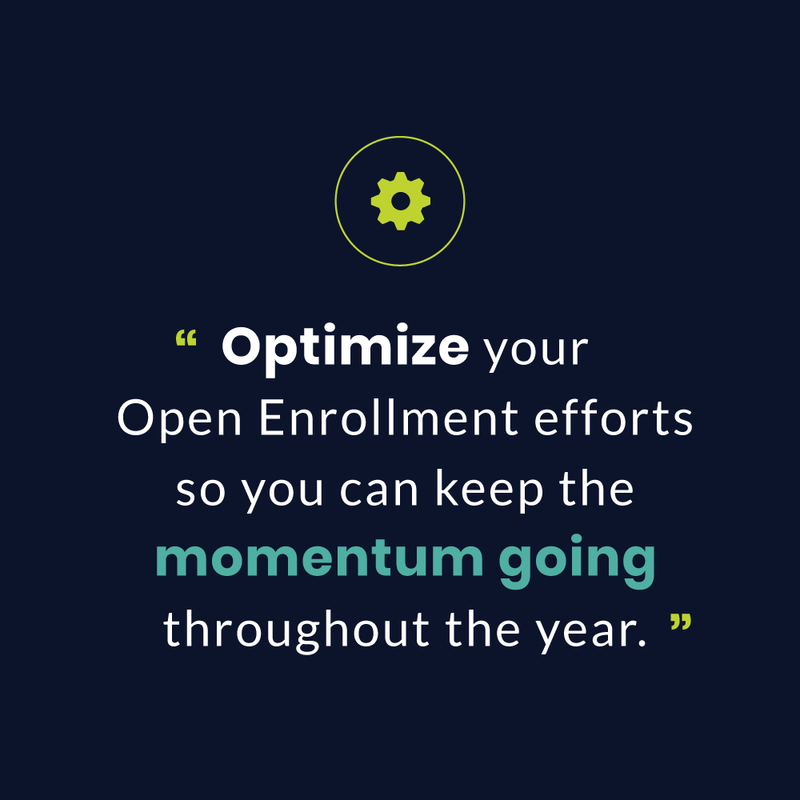 Don’t let all that hard work go to waste — optimize your Open Enrollment efforts so you can keep the momentum going throughout the year. Now that your Open Enrollment is complete, you have a wealth of valuable data available to you that would be the envy of any marketer. Be sure to take the time to analyze this information and capitalize on it. Utilize analytics to learn what communication vehicles were most successful. Track page views and site visits to learn more about points of interest. Analyze the demographics of your audience and identify specific needs and preferences. Are there specific segments in need of targeted education? Once you have your audiences or employee personas defined, you can tailor your communications messages and how/when they’re delivered to match. By targeting your communications, you connect with your audiences in a way that is meaningful and will achieve the results you are looking for. Think about the questions and concerns raised by employees during Open Enrollment. Was there a particular issue that was unclear or misunderstood? Is there a plan or program that is under-utilized? Be sure to track these pain points so you can address them head on. In addition to studying and analyzing data, be sure to collect employee feedback about your campaign. If you haven’t conducted an Open Enrollment survey or focus group, this is the time to do so. You’ll also want to consider the outcome of your communication efforts. Did you meet your communication objectives? In addition to validating the work we do, measurement gives communicators the intelligence needed to develop smart, results-driven strategies. There are many ways to promote your benefits program and increase employee engagement. Total compensation or total reward statements may be at the top of our list. After the Open Enrollment dust settles, is a great time to remind employees of the value of the benefits package they selected. A personalized statement provides an overview of an employee’s total compensation package, including all their cash income and the value of the benefits they receive. 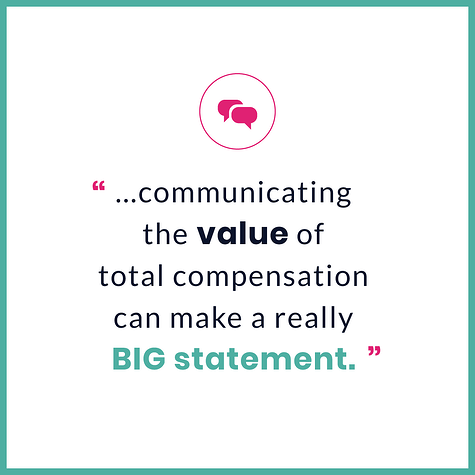 As employers struggle to attract and retain talent, communicating the value of total compensation can make a really BIG statement. Be sure you have a documented communication strategy for the upcoming year. By mapping your audiences, key messages and deliverables, you can promote benefit awareness and education throughout the year — and build on the impact you made during the Open Enrollment period. Tell us... What did you learn from your Open Enrollment process? How will you use this knowledge to improve the way you communicate with your employees? It may seem early to think about the coming year, but by doing this planning in advance you will be in a much stronger position for all your future communication plans. By keeping your message visible and consistent to employees all year long, next year's Open Enrollment can't help but go smoothly!